At this year's Ford booth at SEMA, it seemed that the big crowds weren't gathered around one of the new models on display. 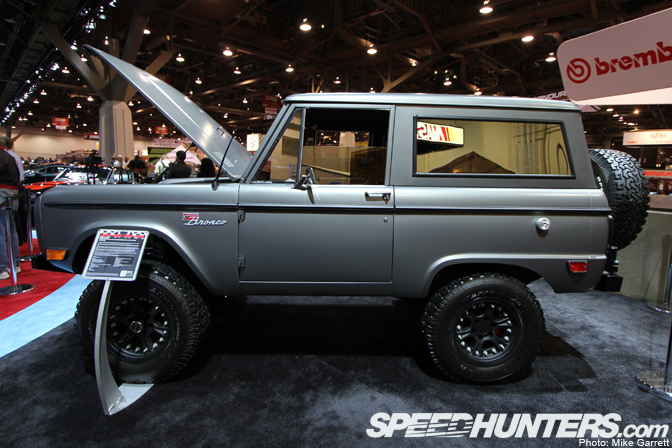 The real draw was the matte gray first generation Bronco you see here. 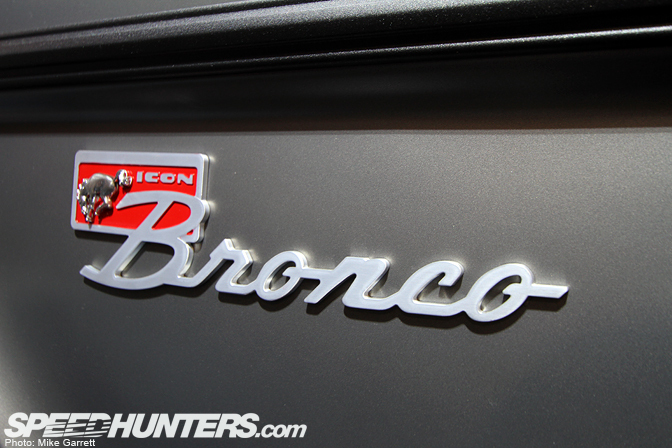 Now we don't feature too many off road type vehicles on Speedhunters, but the ICON Bronco is just too cool not to share. The '66 – '77 Bronco is a legendary vehicle among off roaders, and ICON saw fit to update the original Bronco to modern times. If you aren't familiar with ICON, it's a company in SoCal that specializes in modernized versions of off road classics like the Jeep CJ and Toyota FJ. Beneath the original Bronco body is a custom-designed Art Morrison chassis with coilover suspension. 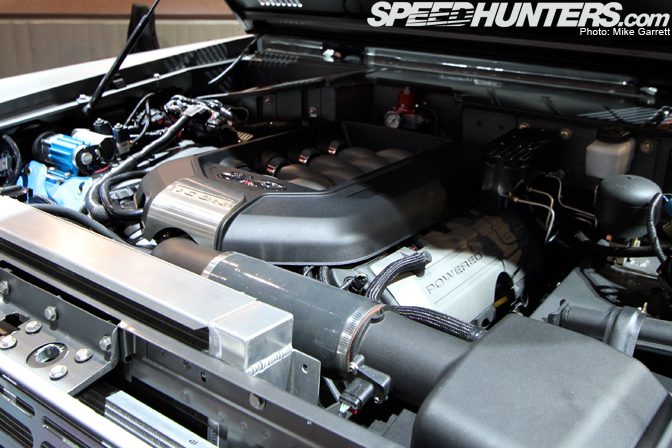 Power comes from a 5.0 Coyote V8 hooked to Aisin Warner 5-speed transmission and Atlas II transfer case. 412 horsepower must be fun in this little truck. Modern six-lug off road wheels and BFG All Terrain tires fit well with the functional theme. The interior has also been upgraded to modern standards, while keeping the flavor of the original Bronco – complete with the single monocle instruments. All in all ICON did a fine job reimaging one Ford's most iconic (pun intended!) vehicles. If like this concept and have some extra cash to spend, ICON will be happy to build one for you. 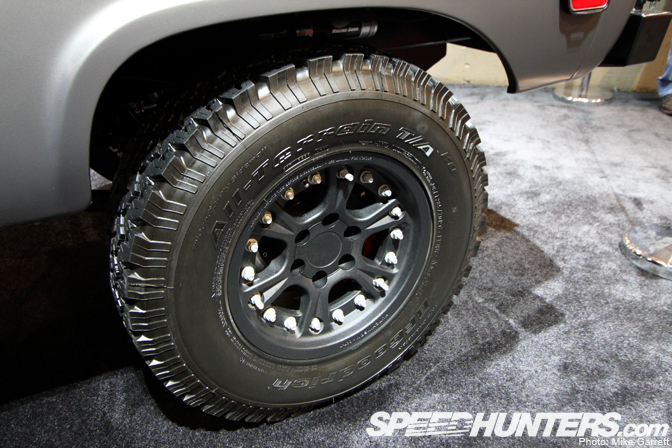 id honestly love to see more offroad vehicles, and trucks in general featured on speedhunters! when you mentioned Bronco in the title, I thought we would be reading about the infamous "white" one. That is awesome only they should have modernized with the new 6.2 ford raptor engine and some of it other parts. Are those Harley-Davidson LED headlights??? I'm runnin' a set of '05-up H-D headlights on my Roadster and have been thinking about switching to those..! Like it a lot, but damn $150,000 MSRP. ^^^^Those look like custom hutchinson beadlock wheels to me. Honestly, I would love to see some more offroads/trucks/utes on here. 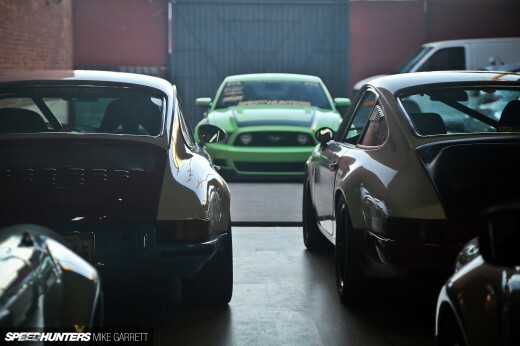 If they can be customised and raced, I say lets have them! More like $190K as shown, and that doesn't include the donor car. And those are indeed the fancy HD headlights. Awesome ride if one can afford it.